In case you didn’t get the invite to the J.Press Warehouse Sale consider yourself invited. On a serious note there are some deals to be had and I believe that the sale ends when everything is gone. There are still a few great items left in various sizes. Most of the sale inventory is J.Press Blue which runs a little smaller than the mainline Press. Below are a few items to wet your whistle (J.Press Warehouse Sale). I like to keep a nice selection of coffee table books around. One of my newer books is called “Cool: Style, Sound, and Subversion” (see here). Overall it is a pretty cool book. It covers a lot of subcultures and is fairly accurate. It gives a 1-2 page write-up with each subculture including Ivy League Style, Preppy, unfortunately no Trad, and what I am focusing on today is the Miyuki-zoku…kind of. What struck me about the the Miyuki-zoku page was the illustrations. I knew that I had seen this image before. It turns out it wasn’t one image, but a few images drawn together. It only took a handful of Google searches to put it all together. 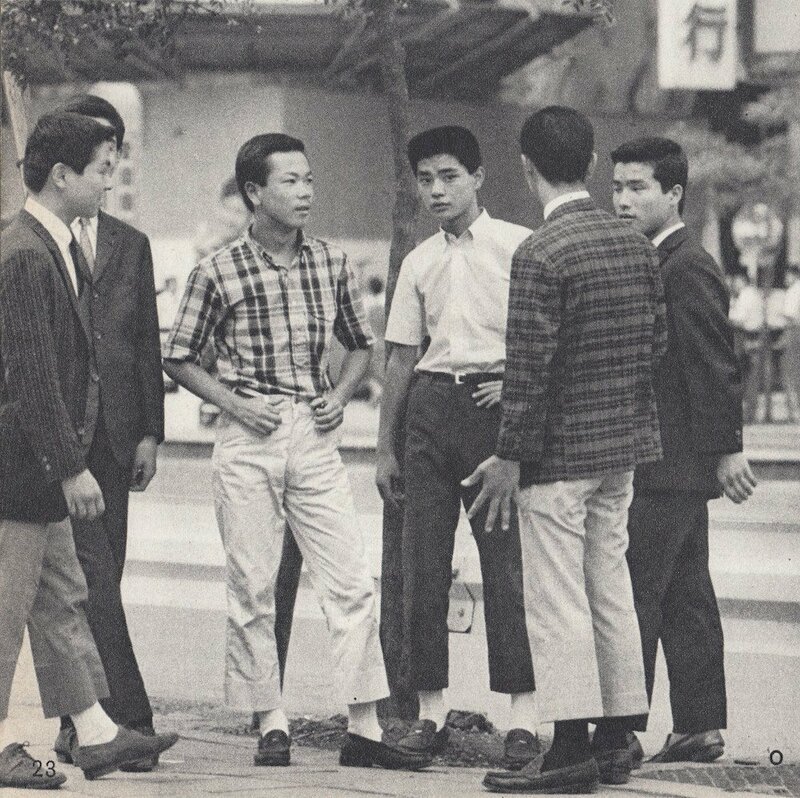 I found our friend on the far right in the madras looking Harrington jacket and Chucks in a blog post on Ivy Style. I then spotted the guy in madras shirt over at Put this On. What was interesting to me about this is that we have photographs being documented in illustrations. I am sure this is fairly common, but seeing it this way just got me thinking about the how cultures and art feed each other. I don’t know where I am going with that other than it is interesting to think about. Before I get too deep let me provide you with links to the articles referenced above so you can read more about The Miyuki-zoku. I just recently acquired the perfect madras popover. It is perfect to me for a reason that you might not suspect. Before you get too excited know it’s no longer available for purchase. Let me get right to the reason that I am so excited about this popover. It is the placket length. The placket (aka the fabric around the front buttons) of most popovers is about half the length of a regular button front shirt (and have 4 buttons). This is not bad a thing, but I had a madras popover about 20 years from Polo Ralph Lauren that had a shorter placket similar to a polo shirt (w/3 buttons like this one!). I loved this shirt and have been looking for another the last 2-3years. Fun fact. 20 years ago I didn’t know the shirt was called a popover I just assumed it was an interesting take on a polo shirt. While the placket length makes it perfect the details definitely don’t hurt. The madras is genuine, the scale of the pattern is small and the colors are muted. The small scale and the muted colors are what’s important to me here as I know that’s what works well for me. The fact that the madras is genuine angle is simply icing on the cake. You guys all know that I stay away from second hand clothing. It is time consuming to search for and returning it is either not possible or a hassle that I would prefer not take on, but when you win you can win big. This shirt may not push me to scour the internet for old PRL Rugby, but it may serve as a blueprint for more perfect popovers. If I had to sum up the trad look of the 2000’s in one photo this would be the picture that I choose. I think that it embodies the sentiment of trad style very well. It is far more casual than its forefather ivy league style while at the same time a little more reserved than the preppies that came after, but obviously a product of both. Everything about this photo screams trad. The Barbour is quintessential trad when combined with a sport coat or navy blazer. At the same time here we have the Brooks Brothers 1818 sack which is important because it is (I almost write was, because I have heard rumors) one of the last mass-produced 3/2 sack blazers on the market. The shirt is a simple blue university stripe paired with a Brooks Brothers No. 1 Rep (See BB Tie Nomenclature here), but most important here the is collar roll. The chinos are plain front with cuffs and little to no break (Cuff, no break). Finally it is capped off with a pair of penny loafers. Mine are cheapo Weejuns, but if I had unlined Alden LHS from Brooks Brothers I would have featured them. After my recent post on going sans tie I was pressed about my desire to wear a tie. This led led me to do some reflecting. Why do I want to wear suits, sports coats, and ties? I know that I have always liked and been interested in style but I don’t think that this is the driving factor. What I do think is driving or at least was driving this aspiration is rite of passage. I had imagined that at some point in my life that I would be a successful adult man. I pictured myself working in a downtown office, wearing suits, and carrying a briefcase, but it seems like I missed that boat. When I entered the workforce it was a sea of business casual and casual Friday at best. I pushed forward wearing a tie albeit occasionally. As I wrote a few weeks ago this is not always best for your career. It hasn’t harmed mine yet, but I have learned when and where I can away with it. Dressing like a business man was something that I had looked forward to happening. Similar to getting a drivers license, voting, or having your first drink is how I viewed getting to wear a tie. It was also a mark of success in my mind. It was part of my rite of passage into adulthood and I feel like I got the short end of the stick, but that’s probably a lot better than no stick at all. I will leave you with a few thoughts (and lots of ties pictures!). Maybe the real transition was never about the clothes at all, but rather conformity? Perhaps how I feel about not getting to wear a tie is how others felt in the past when they were forced to wear a tie in the office? They hated it, but they did it because they were grown-ups.